One of my very first memories — vivid in my mind but probably a mixture of early experiences – is collecting topaz crystals with my father in west-central Utah. Today, I know we were at Topaz Mountain, but my childhood memory is an image of a sandy wash on a cold winter day. I was probably 4 years old given that my father was on temporary duty away from Los Alamos and working at the Dugway Proving Grounds. My father had made a couple of screens, and we were shoveling the sands of the wash on to the screens and sorting through the leavings for nearly colorless topaz crystals. We found then by the bucket load, and I remember holding in my hand dozens of crystals that sparkled brightly in the sunlight. I don’t really remember what I was thinking when I held those crystals, but I have been collecting minerals ever since that trip. In the 54 years or so since that memory I have searched through a thousand mines in the western US for minerals, built a dozen collections, made large rock gardens, sold thousands of minerals to buy a few hundred, and visited every mineral museum I could find in the world. I discovered mineral shows in the 1960s, and in 1973 my father and I went to our first Tucson Gem and Mineral Show. It was an amazing experience for me – we first went to the Desert Inn, and I could not believe the array of minerals for sale on the top of beds in a hotel! However, it was the main show that hooked me forever. On the show floor were special exhibit cases, and one of the very first we visited was Harvard case, which contained what I think, is the world’s most famous mineral: a 5-inch tall “ram’s horn” of gold from Colorado. I was spell bound! And right next to the gold was cerussite from New Mexico that was so much better than anything I had ever seen from my home state that I was in disbelief. I have not missed a Tucson show since that time! The experience of that first Tucson Show had a profound effect on me, and it is fair to say it shaped my life. I went to New Mexico Tech for my undergraduate degrees, and many weekends were spent collecting minerals from all over New Mexico – these were the seed corn to my personal collection. Every February I would load up my pickup with the spoils of my efforts and head for Tucson. I would sell everything (for a lot less than I hoped) to a couple of dealers in motel rooms, and then use the money to buy 5 to 10 minerals for my collection. Nothing was easy, but 1970s were a far different time, and there were many mineral dealers interested in good, colorful low-end specimens in bulk. I still have 3 specimens that I purchased in those heady days. When I graduated from Caltech in 1983 with a degree in seismology I had 4 different job offers, but there was only one that I wanted – a professorship at the University of Arizona. I am a bit embarrassed to say that I based my career choice not on scholarly reputation, but rather on the opportunity to live at the center of the mineral collecting universe! 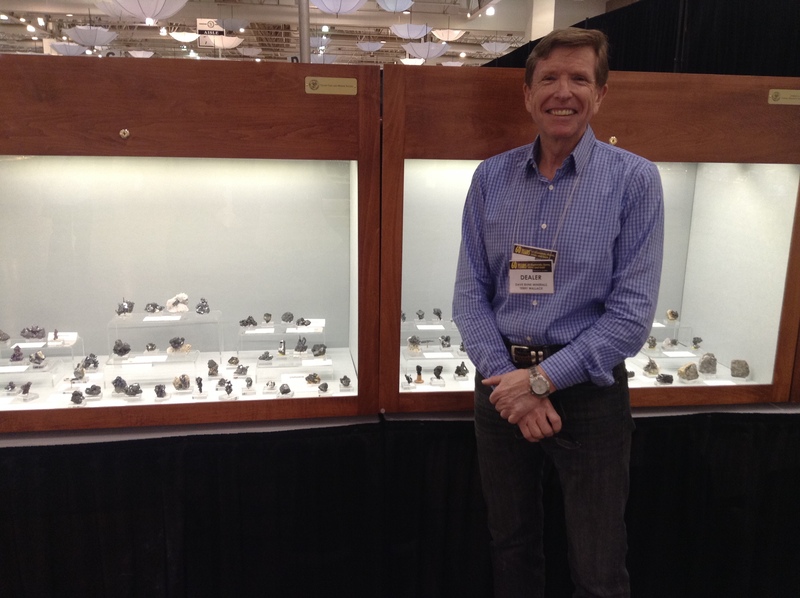 2014 is the 60th Anniversary of the Tucson Gem and Mineral Show. Every year they have a theme, and this year in honor of the 60years of bringing thousands of collectors from around the world to southern Arizona, the theme is “Diamonds, Gold and Silver”. The theme serves as a focus for special exhibits on the show floor, and I committed to put in several cases of my minerals and help organize a community display (in general, I do not like to display my collection – in fact, I don’t particularly like to show my minerals even in my own home). Since the mid-1980s I have exclusively collected silver and silver minerals. Although I enjoy mineralogy and mining in general, silver is my passion. Else where I have written about silver: “For many collectors, the word conjures up images of baroque ropes of white, lustrous metal from Kongsberg or beautiful herringbone plates from Batopilas. For other collectors, the vermillion red of a Chanarcillo proustite is the most alluring color of all specimens. Silver and silver-bearing minerals are part of the nobility of the mineral kingdom; no other group of minerals has more associated mining lore or history. Silver financed empires and great wars. Silver is said to have magical purifying properties, and alchemists promised secret processes to turn lead into silver (both of these myths are partially true!). To the mineral collector, silver minerals hold a particular fascination. 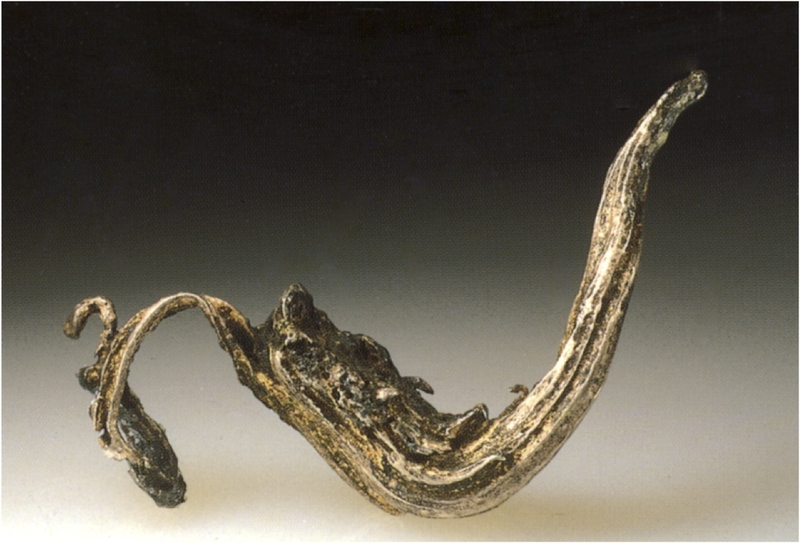 Superb specimens are known from hundreds of localities worldwide, and unlike gold, silver is quite a reactive element, forming more 160 different silver-bearing elements”. I brought minerals for two cases: one focused on native silver and acanthit group minerals (acanthite has the formula of Ag2S, and the acanthite group minerals include some substitution for silver like Japlaite and Sylvanite, and there are also substitutions for sulfur including tellurium and selenium for Hessite and Naumannite ), and the other focused on pyrargyrite, proustite, stephanite, polybasite, and handful of other silver minerals that were some of the best of their kind. Silver owes is wonderful qualities to its placement on the periodic table. Silver has an atomic number of 47, and sits below copper and above gold. These two metals are in many ways similar to silver, but they show relatively more and less mineralogical diversity. Gold is heavier and a larger atom, from which it is more difficult to remove electrons. Thus, gold tends to stay mainly in the native state or form semimetallic compounds with tellurium and silver. A copper atom, on the other hand, is smaller than an atom of silver and can readily give up either one or two electrons in the process of forming compounds. This allows for the formation of many more copper minerals than silver minerals including copper silicates and carbonates. All three metals have similar atomic structures, which is a face-centered cube held together by metallic bonds. A characteristic of a face-centered cubic lattice is that the metals are extremely malleable and ductile as well has good conductors of heat and electricity. Silver has the highest conductivity of the metals. Native silver has a bright white color; it has the highest reflectivity of any metal in the visible spectrum, and thus appears to “shine”. 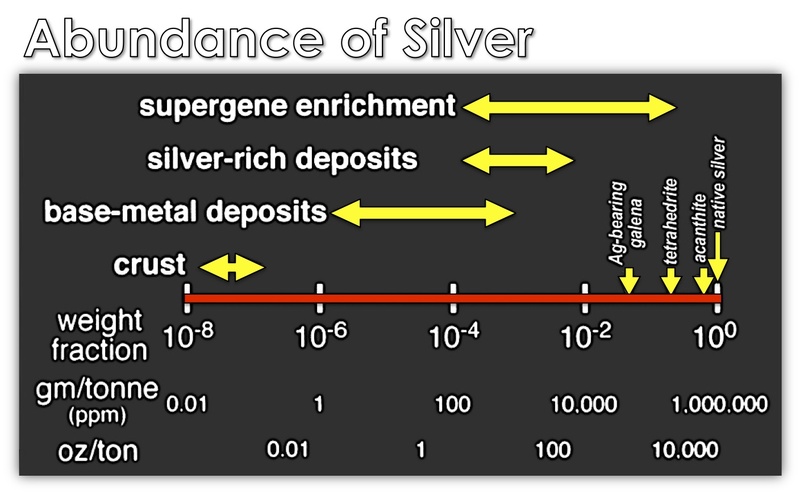 When not in its native form, silver is generally monovalent (Ag+1). The silver atom has an affinity for anions of sulfur, selenium and tellurium, all of which have similar anionic radii. These silver minerals are known are silver sulfides (in the nomenclature of Dana, these include the tellurides and selenides), and are the most important ore minerals for silver. The acanthite group is the most common and simplest of the sulfides. This group includes acanthite, argentite, aguilarite, naumannite, hessite, petzite, empressite, jalpaite, stromeyerite and eucairite. This group of minerals displays a remarkable structural phenomena called temperature-dependent dimorphism. At high temperatures these minerals are usually cubic or hexagonal, but at lower temperatures these minerals exhibit orthorhomibic or monoclinic structure. The transition temperature is usually between 130o and 180o C. Acanthite and argentite are the most common dimorphic pair, and most specimens of acanthite seen in mineral collections show a cubic or octahedral habit “frozen” in at the higher temperature of formation. Silver sulfosalts are the most beautiful group of silver minerals. The sulfosalts are composed of silver, lead, and copper as cations and at least one semimetals (arsenic, antimony, or bismuth) linked with sulfur in anionic groups. 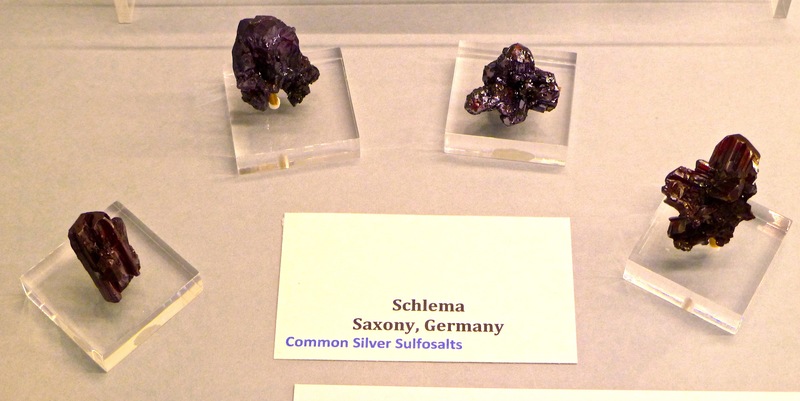 Two of these sulfosalts are proustite and pyrargyrite are known as the “ruby silvers” because of their translucent red color. In the ruby silvers the anionic group is either AsS3 (proustite) or SbS3 (pyrargyrite), arranged in a trigonal pyramid. The semimetal is at the apices of the pyramid, with the sulfur atoms at the base. Silver atoms connect the group in such a way that each sulfur atom has two nearest silver atoms. Both proustite and pyragyrite are light sensitive; exposure to certain wavelengths of light break one of the sulfur bonds and liberate a silver atom that migrates to the surface of the crystal face. Over time ruby silvers become black, which is the result of a thin silver coating on the crystals that quickly reduces to acanthite. Although there are more than 160 silver bearing minerals, only about a half dozen are relatively common in macroscopic crystals. The simplest of the silver minerals belong to a group called the silver halides, which are ionic bonds between silver and C, Br, or I. The largest number of silver minerals are sulfosalts (including proustite and pyrargyrite) with more than thirty distinct species. The two most common in crystallized specimens are stephanite (Ag5SbS4) and polybasite (Ag16Sb2S11). A family of prostate crystals from the sulfosalt case — very hard to get the red right, but great crystals one and all. I also organized a community case on Kongsberg, which is the most famous locality for native silver in history. When silver was chosen as a theme for the show I knew we had to put together a case on Kongsberg. I volunteered to get a couple of the famous collectors to commit to bringing a few specimens to be put in an exhibit. The fraternity of silver collectors is relatively small, and we all know each other. It was easy to get people to commit — but it was harder to get the contributors to limit the number of specimens that they brought! The MAIN Tucson Gem and Mineral Show is always an event. The show lasts 4 days, and the Tucson Convention Center and Arena is filled with mineral, gem, fossil and jewelry dealers along with spectacular special exhibits and seminars and talks. The public paid attendance is about 35,000, but the actual attendance with dealers, exhibiters, students and guests is probably about 50-55,000 people. Anyone that is a serious mineral collector comes to this show, and it is very international. It is fair to say that most of my closest friends are in this community, and the common interest of things “mineral” creates a strong social fabric. The opening of the show on Thursday is a mad rush – and mostly serious mineral people. Within an hour the floor is swarming with people looking through dealers stock, and after that, cruising the special exhibits looking at the treasures that come from around the world. My experience is that not too many minerals are sold on Thursday, but lots of decisions are made. Those decisions are consummated on Friday and Saturday (and for the most part, the mineral community believes that all sales are negotiations, so serious work is needed before minerals exchange hands). 11 am opening day at the Tucson Show, one hour after the doors opened. 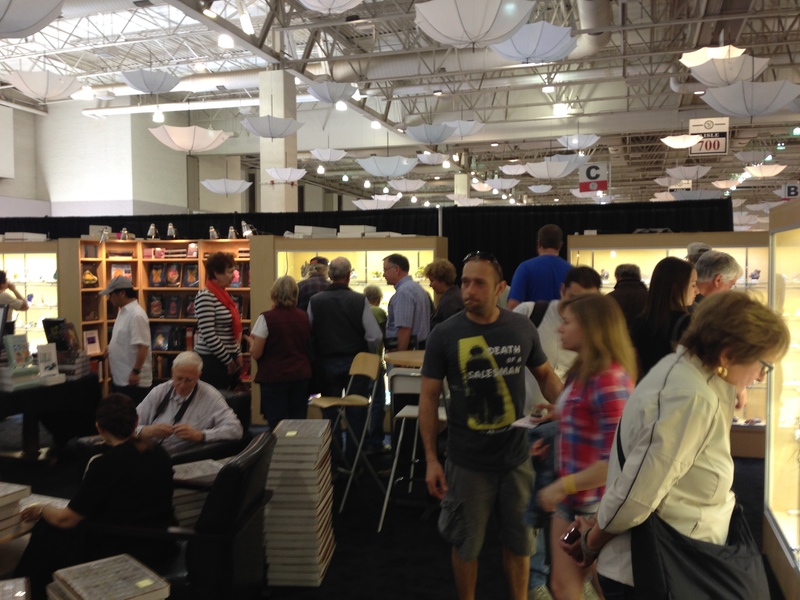 This is the booth of my friends Dave Bunk (Dave Bunk Minerals) and Gloria Staebler (Lithographie). 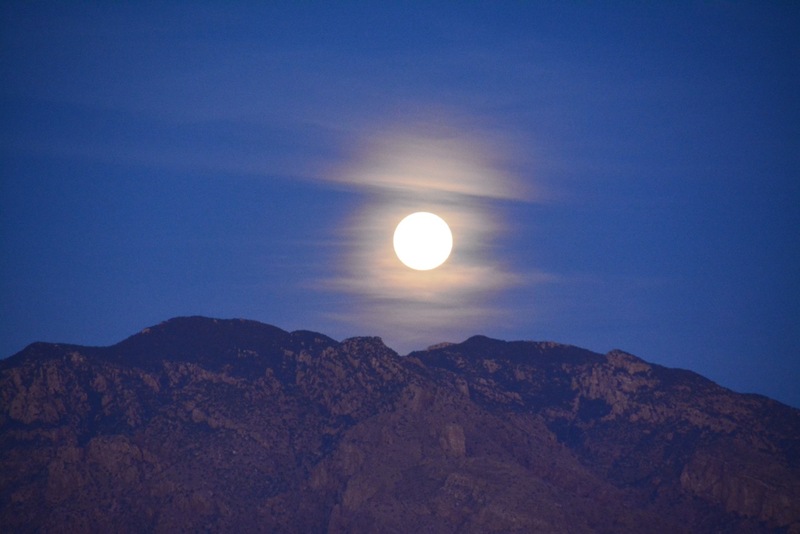 Every year the most asked question is “what’s new for this year”, meaning what new mineral discovery has happened in the last year and is marketed in Tucson. This year the biggest news are some extraordinary azurite crystals from Milpillas. Milpillas is a copper mine in Sonora, Mexico, across the border from Bisbee, Arizona. Milpillas mining operations entered a zone of carbonate rocks in 2006, and wonderful copper carbonates flooded the market. The quality was on par with the best ever – similar to Bisshee from the turn of the 19th/20th century and Tsumeb in the mid-20th century. About 2 years ago the oxide zone was exhausted, and it seemed that the Milpillas era had come to an end. The mining begin in the sulfide zone and the milling operations were altered to reflect the sulfide feed stock. However, six months ago the mining encountered a fault zone that had allowed the carbonate mineralization to occupy a sliver within the sulfide zone. It seems that mining management turned a temporary blind eye to the miners collecting the fault zone since the milling process was already adjusted to a different chemistry, and some truly extraordinary azurites have come to light. In my opinion these may be the finest azurites in history; however, thee are thousands of pieces for sell, so there is a psychological numbness to importance of this mineral find. 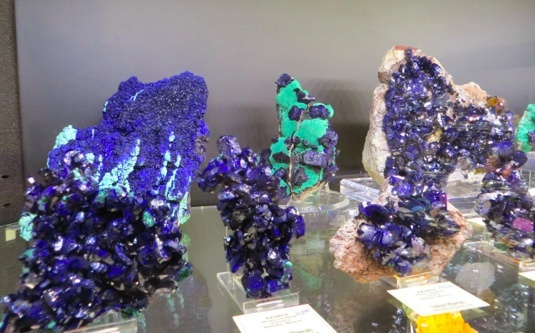 Ten years from now the entire mineral community will talk about the “great old days” for azurite crystals. Milpillas azurite in Evan Jones’ booth at the Tucson Gem and Mineral Show. My favorite part of the show is the special exhibits. It is like visiting museums and great private collections from across the world. There were great displays on the theme – diamonds, gold and silver. One of the many surprises was the Smithsonian display on diamonds. They literally had a pile of diamonds that had been confiscated from smugglers that get turned over to the museum. 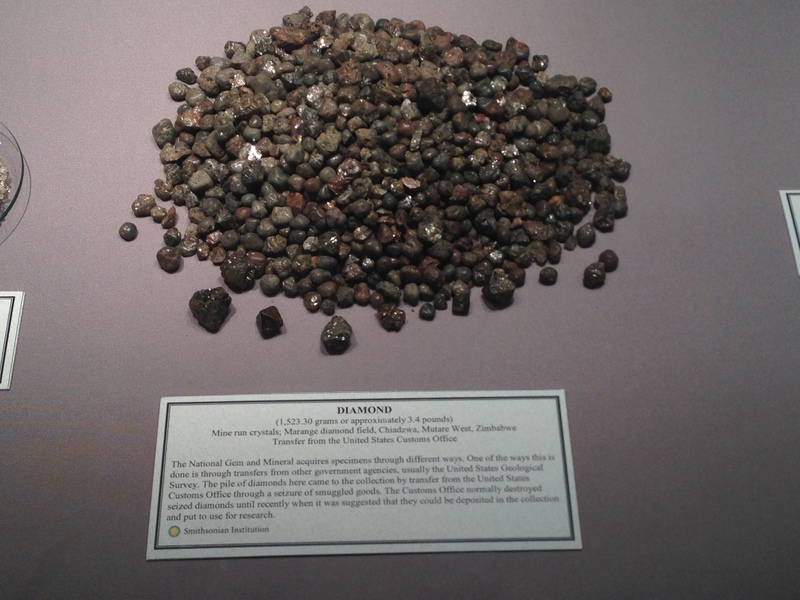 Pile of diamond — the Smithsonian Institution. There are more than 130 exhibits, and the vast majority are wonderful. A couple of the exhibits were very unusual though and caught my eye. For 4000 years mankind has been carving gemstones and minerals for decorations. We have a fascination with the natural beauty of stones and the perfection of nature to present color and form. 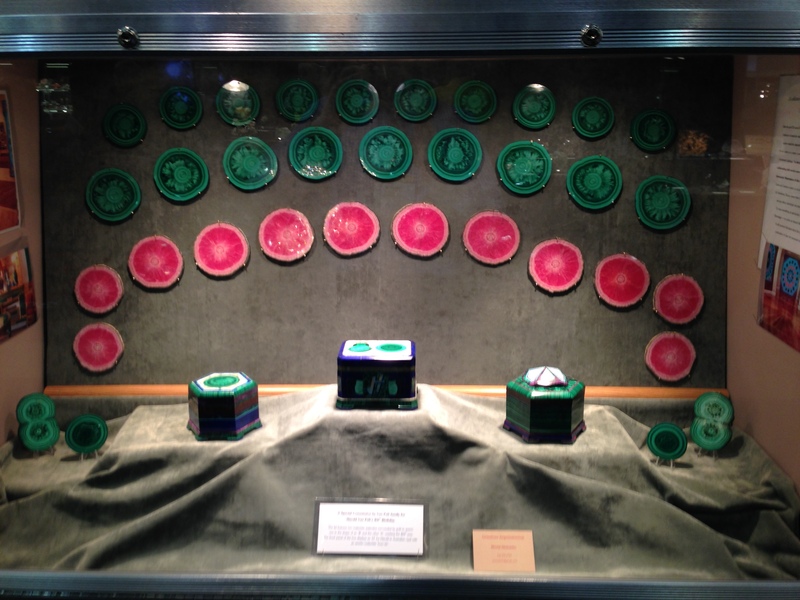 One of the cases that I really liked this year had polished slabs of rhodochrosite and malachite – pink and green. These slices were cut from stalagmites, and the concentric rings are not unlike the growth rings in a tree. The display matched the size for these stalagmites to make for a stunning display. Slices of rhodochrosite and malachite. 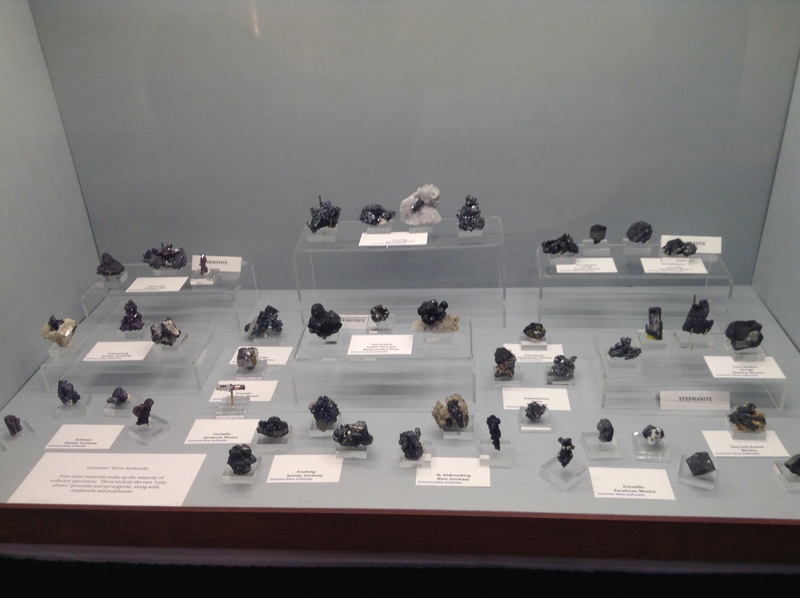 The University of Arizona Mineral Museum had several displays, all very good. 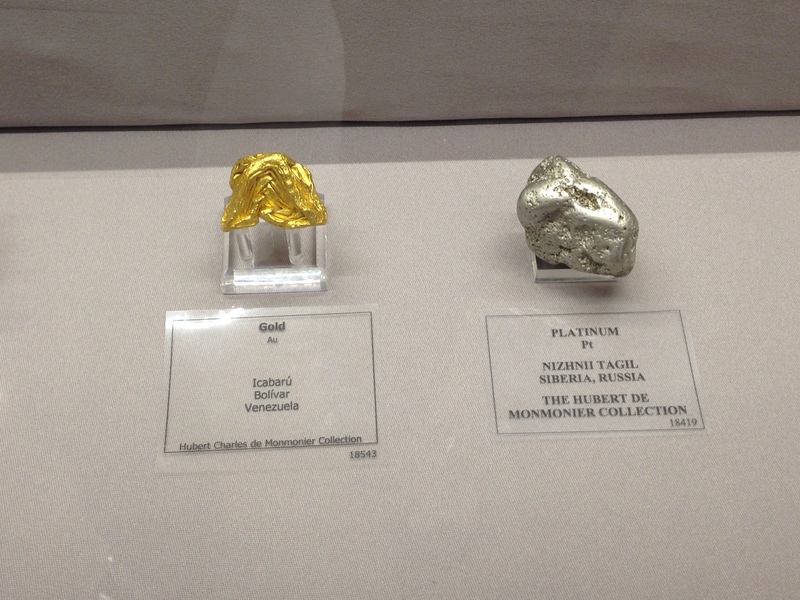 However, one had special meaning to me — gold, silver and platinum from the Hubert C. de Monmonier collection. This was the last major donation I worked on as curator of the Museum, and is a fabulous, eclectic collection built over a life time. Hubert was a man of modest means but he built a world case collection; 871 mineral specimens including 350 quartz specimens, 146 tourmaline, 44 silver, 38 beryl and more than 70 gold specimens. Gold and platinum from the University of Arizona Mineral Museum. Another favorite case for me was assembled by Dave Bunk to show the best of Colorado silver. There are three mining districts in the state that stand out: Aspen, Creede and Leadville. The two former districts have produced the bulk of notable specimens. Dave collected specimens from private collections (his own, Bryan Lees and Ed Raines in particular) as well as the museums at the Colorado School of Mines and the Denver Museum of Natural History. 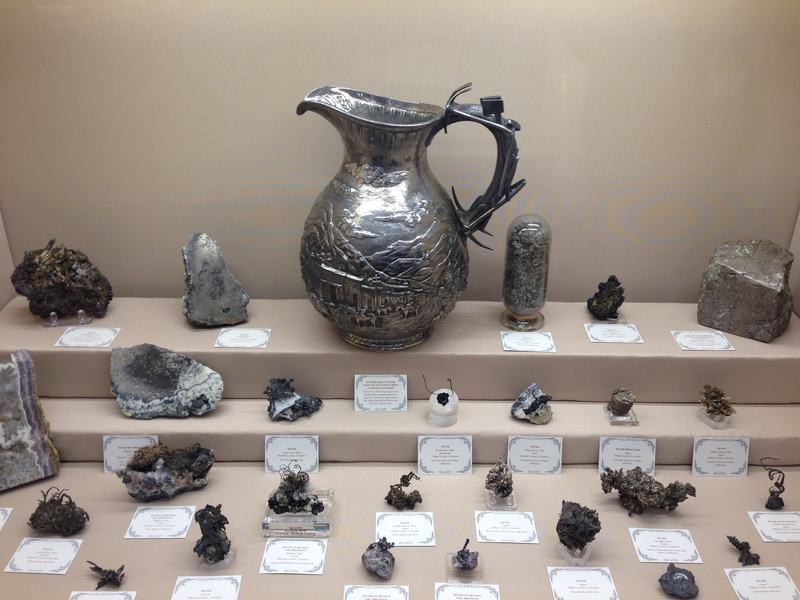 Included in the case were some historic artifacts — a vase made from Aspen silver, and a chunk of the largest silver “nugget” found at Aspen (it is the block in the upper right hand corner of the picture of the case). 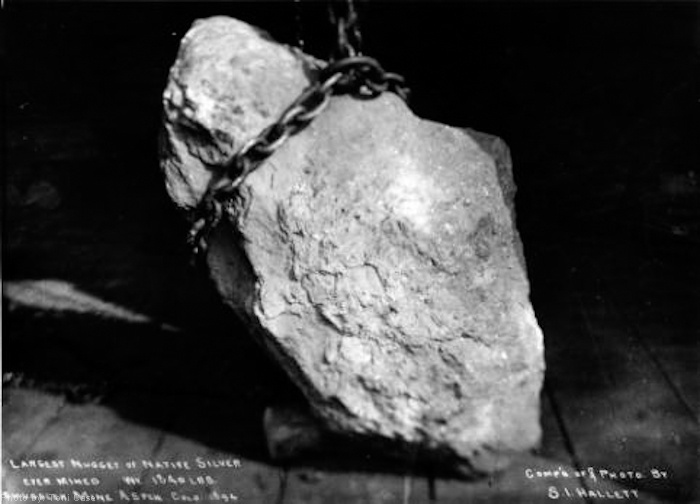 Smuggler Mine silver “nugget” found in 1894 weighing 1840 lbs. The Dave Bunk display contained a piece that weighed about 5 pounds! Finally, a case that I really enjoyed celebrated birth of modern crystallography under one of the founders of mineralogy, Abraham Gottlob Werner. Werner was born into a mining family, and he studied mining (and law) at Freiberg, which is an grand locality for silver and silver minerals. In 1775 he was appointed an instructor at the Freiberg Mining Academy, and he published the first modern textbook on descriptive mineralogy, Von den äusserlichen Kennzeichen der Fossilien. The case displayed a collection of wood crystal models that were hand made to illustrate the various classes and forms. 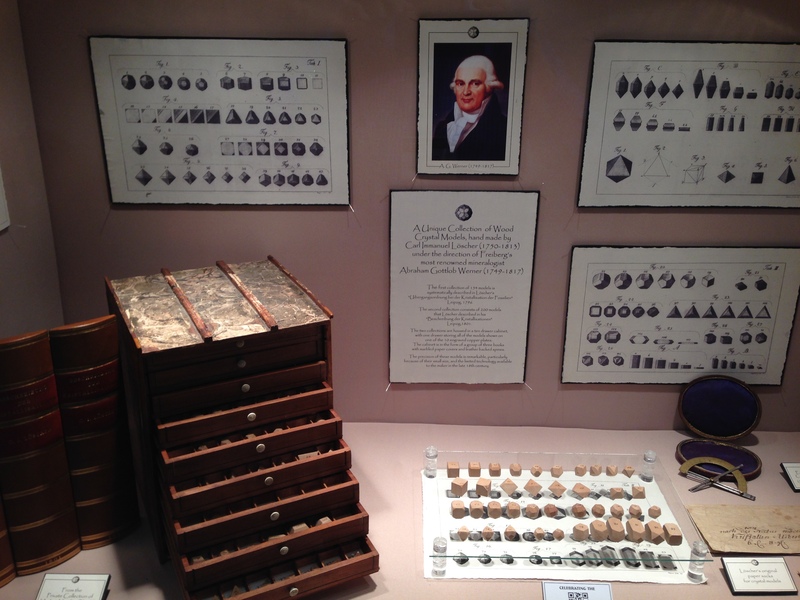 The wood crystal models created at the direction of the father of modern mineralogy. The Tucson Show is always an experience – educational, social, and even spiritual. This year’s show is special for its exhibits. Although the sense of wonder that I had when I first went to the show in 1973 can’t be duplicated, the show still is grand on an international scale. 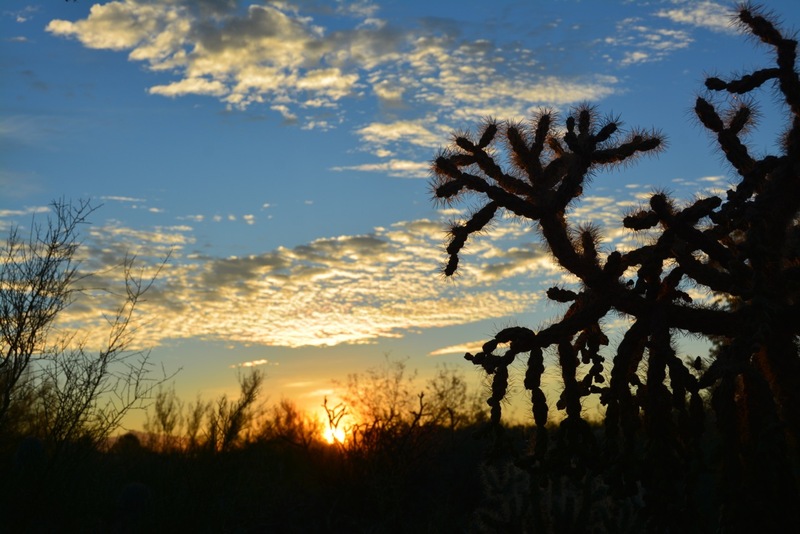 Tucson itself is fabulous in its own way with a unique flora and fauna, and skies that are magic in the winter. Still much show to go in 2014, but it has already been a great event.